"Pick your battles" is a phrase often used in this business, and it reflects the reality that fighting over everything wastes effort and hurts your credibility, and so just because you may have an argument to make doesn't always mean you should make it. The order shown here is an excellent lesson in why that's true. "We need a continuance" is another common phrase, and we've seen some unusual reasons given, and accepted, for such a request. For example, several have been granted on the grounds that somebody's favorite team is in the playoffs. At least one has been granted on the grounds that deer season was about to start and there would likely be nobody left in town to serve on a jury. Then there was the motion for extension of time based in part on the grounds that "undersigned counsel has seven puppies (born to her King Charles Cavalier) that are dependent upon her" and a tropical storm was approaching. Also granted. If somebody can get an extension based on the fact that her dog just had puppies, there is really no point in objecting to a similar request involving a human infant. The motion here was based on the fact that one lawyer's wife was due to have a baby about two weeks after trial started, and that side asked for what the court called a "brief continuance." Counsel conferred, and then informed the court that they could not agree. "Well, every party is entitled to file an opposition to a motion," the court wrote in this order, saying it had been hoping that the rumors it had been hearing of said opposition were exaggerated. But the brief arrived on Monday, the court said, "and it was, sadly, as advertised." The lowlights of the opposition: (1) it argued that "utilizing simple math," the due date should have been known some time ago (the court declined to speculate on the date of conception for "reasons of good taste which should be (though, apparently, are not) too obvious to explain"; and (2) it pointed out that the movant's side had five attorneys (and so could spare one), which would have been a better argument if the opposing side did not also have five attorneys. 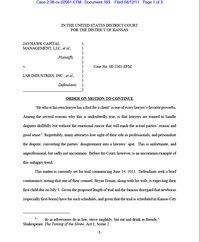 The order (all of which is worth reading) concludes: "Defendants' Motion is GRANTED. The [new parents] are CONGRATULATED." You probably don't want to be in a situation where a judge has not only ruled against you, but also congratulated the other side. That's a good sign you should have stayed out of that battle in the first place. Update: Story makes the New York Times (citing LTB). Thanks, submitter person.